Here is the bad news: whatever I do – my life will end. One day. In the meantime, the one thing I can do is to make the best out of it. Enjoy what life offers, spend time with the people I love, and be kind to others. Find my mission in life. Easier said than done, says you. As always, Leonard Cohen got it when he remarked, “The older I get, the surer I am that I’m not running the show.” But – I can pick the part. my role in that show. Will I be the sad guy, will I be the joker, will I be the reasonable, the angry, the happy, the lonely, the party-goer? Bad things will happen in my life. (They have.) But even when that happens, I can run along the sea, watch the sun coming up over the horizon and the frozen ground. And feel blessed. I will come across horrible people. But when that happens, I can decide that they will not define me, that I will acknowledge them but not engage; instead, I can decide to spend time with people I love, with people who love me. I will come across people who need help, a kind word, a smile, a ‘how are you today?’ and I can decide to offer that to them; and discover that when I’m looking at their faces, I am looking in a mirror, I will see a kind, beautiful face with a lovely smile and a sparkle in the eyes. Pádraig managed to control his face, his lips, his tongue today when his speech and language therapist today asked him to show her how to make a narrow “O” and a broad “I” with his mouth, to move his tongue as fast as he could from left to right, between his teeth and lips. He tapped his feet to the music during Music Therapy, and made a few loud, prolonged sounds. At the end of the day, he was proud of what he had achieved and he had every reason for it. 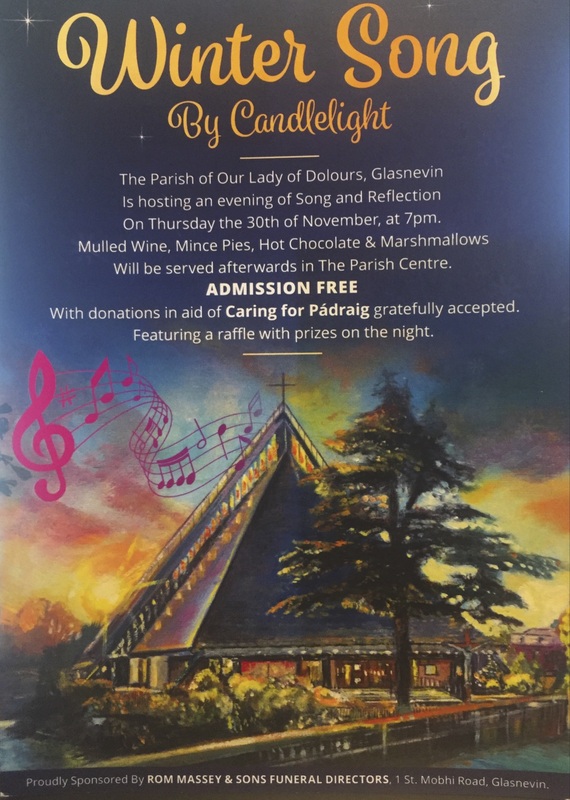 If you are free tomorrow evening, join us in Our Lady of Dolours, in Glasnevin, at 7pm, opposite the main entrance of the Botanic Gardens for a fabulous night of Winter Songs by Candlelight, followed by mulled wine, mince pies, hot chocolate, and marshmallows – and an incredible raffle. All proceeds will go to Caring for Pádraig, allowing us to provide Pádraig with the therapy he needs to continue to make progress. The first of Advent is around the corner, so is the promise of light, the star that will lead the way to new life. Rumour have it that the Irish Minister of Finance (!) has made a donation. Another first! And very gratefully received!